There’s simply nothing more versatile than knitted shawls. They can be lacy or chunky, bright or neutral, cabled or just plain garter stitch, but they are always stylish, useful, and perfect for when you need a little extra warmth. 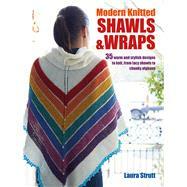 Laura Strutt has designed 35 beautiful shawls and wraps, with something for everyone, from novice knitters to experts. Divided into Bright and Beautiful, Warm and Rich, and Neutral and Natural shades, the patterns use a complete rainbow of colors, including variegated yarns. The stitch patterns are just as diverse, with textured triangles, beaded lace stitches, and overlapping “waves”. Start with a beautifully warm garter stitch wrap in a cool glacier blue—quick to knit even for a beginner—or a rainbow-striped triangular shawl. Then try a fashionable ombré-shaded shawl with an eyelet pattern, or a gray and white monochrome shawl with a bright contrast edging. For more experienced knitters, there are larger projects such as the brioche-stitch shawl, or the feather and fan stitch afghan in a variegated silk-based yarn. Whether you are knitting a cover-up for yourself, or a gift for a friend or family, you will be spoilt for choice with these beautiful designs. Laura Strutt is a passionate designer and enjoys knitting and crochet, as well as dressmaking, quilting, and hand-lettering. She is a former Editor of Craft Business magazine, the leading trade publication. She launched Sew magazine, a monthly contemporary stitching title, in 2009 and continued as Editor until 2012, leaving to pursue freelance work. Laura is the author of several books, including Modern Crocheted Shawls and Wraps, 35 Knitted Baby Blankets, Modern Granny Square Crochet, and Arm and Finger Knitting, all published by CICO Books. Discover more of Laura’s designs, technique guides, and crafty inspiration on her creative lifestyle blog, www.madepeachy.com. Laura lives in Colchester, Essex, UK.